What is unique about these prunes? 1) Taste, yes taste is literally AMAZING. Just one bite and sweet/sour punch will override all other taste signals coming to the brain in a symphony of flavors. The ratio of the sweetness/sourness, with a hint of smoky aftertaste is SPOT-ON. Same taste promoted these prunes from Eastern Europe all the way to Asian cuisine, where these are highly south after. This is our largest, bulk, package of the Serbian prunes in stock. We are proud to offer a product that is made in local district of Shumadija and to support a local community of growers. Such small manufacturing is what supports the local schools and keeps this tradition alive. 2) Tradition; these prunes have been manufactured following the 5 century old tradition of plum cultivation in Serbia. 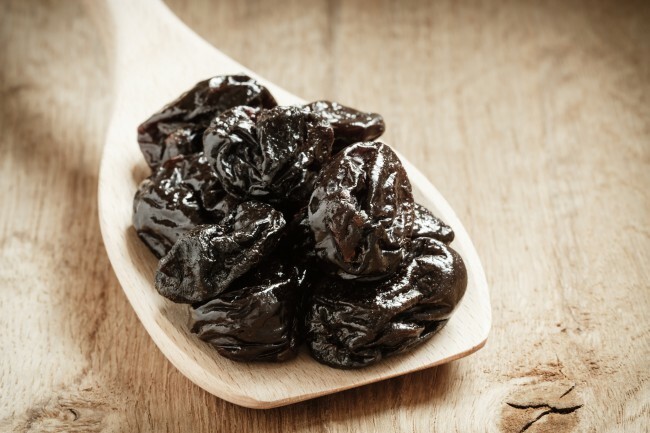 The actual parameters of the manufacturing of these prunes are closely guarded secret, but the juicy results are not. One of the finest prunes available on the market today available only from U.S. Wellness. 3) BPA FREE packing; the prunes are packed in re-sealable stand-up pouch that houses a hefty 8lbs of prunes. The multilayer design preserve the freshness but it is also BPA free. 4) Certified Origin. We don't just claim that our product is of certain origin, we carry the origin certificate (FORM A). AVOID companies that cannot produce this and the phytosanitary certificate. 5) These literally cost 45% more than then next in line. That says something about our source and it also tells about our commitment to truly bring something outstanding to our customers. Please, feel free to ask us any question and we would be happy to answer. 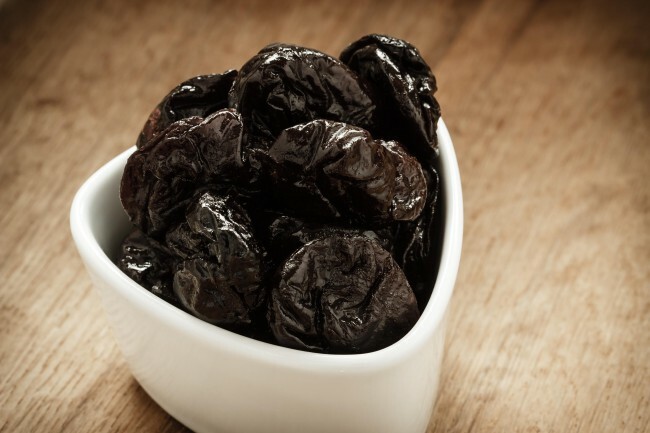 Prunes are considered a super-food. 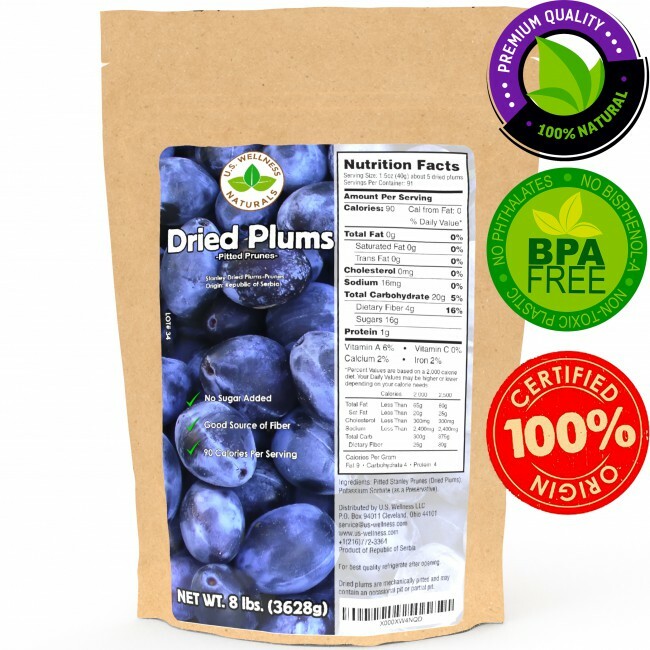 Single serving of dried plums contains 10% to 19% of Daily Value (DV)* of fiber and contains double the amount of antioxidants compared to that of a blueberry antioxidant content. Eat dried plums daily to prevent oxidative stress, which is according to the results of scientific research, one of the leading cause of number of preventable illnesses. Plums, from Stanley variety of plum tree from the Sumadija district, are packed with antioxidants and are renowned internationally. This is the reason this food comes 6000 miles away from the densely forested Sumadija region (Serbian Cyrillic “Шумадија” or Shumadya pronounced [ʃumǎdija] is translated as "forest-land", something of an Eastern European State of Pennsylvania). 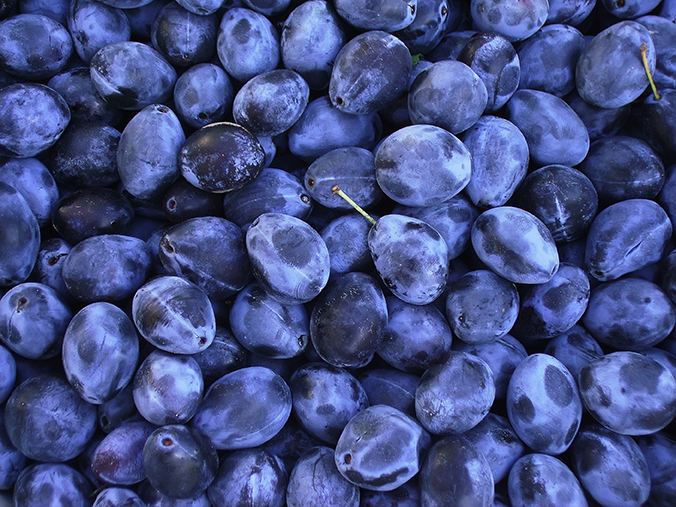 The Serbian plum is the fourth most produced in the world, yet somehow virtually non-existent in U.S. market. With a long standing tradition of plum growing, Serbian prunes have established a well-earned place among dried fruits. 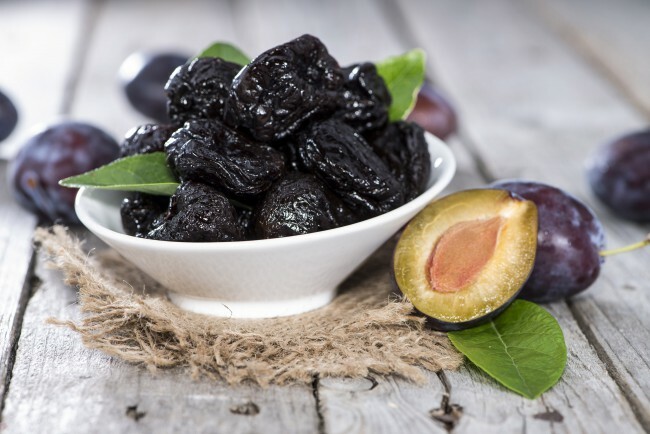 Today these prunes are important part of French, German, Japanese and Middle Eastern cuisines. *Based on 2000 calorie/day diet.